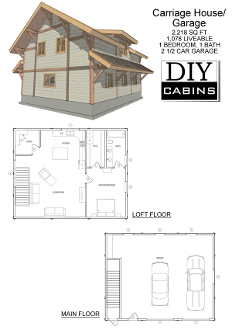 Log Cabin #14 is a 2,218 sq ft carriage house with a 2 1/2 car garage on the main level and a 1 bedroom/ 1 bathroom home on the second floor. The Carriage House is a cute, multipurpose house. Conventionally framed with lots of log accents, this cabin offers you many comforts, without taking up a lot of space or money. The oversized 2 car garage gives you plenty of room to park, while giving you lots of additional room to either work, or store your toys. The second floor has a spacious one bedroom home, complete with a private entrance. The unique layout boasts a large master suite with a walk in closet and master bath. The roomy kitchen is open to the oversized living area. Add the shed dormer on the back for the truly unique roof line and the large window off of the living room for an expansive space.